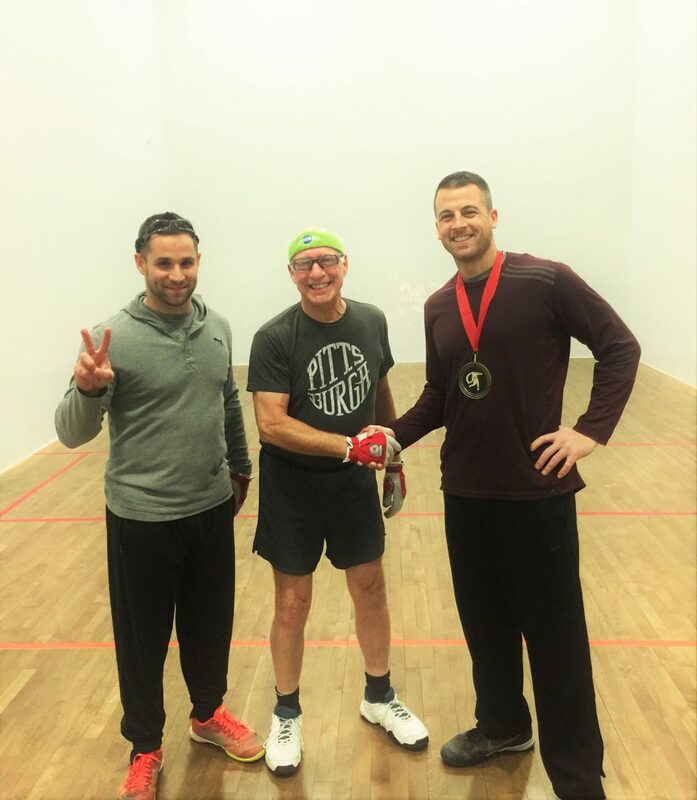 Pittsburgh, PA, WPH Press, 12/13/17- The WPH and Pittsburgh Handball were excited to present the first Pittsburgh Ladder Holiday Cup singles on the second week of December at Amerifit, the home of the WPH RFC. Six Pittsburgh Ladder stars were joined by two wildcard entries to make a full quarterfinal draw. Pittsburgh Ladder stars have battled in weekly matches all year to gather ranking points and bragging rights and a spot in the RFC Cup starting lineup at the RFC 10 RFC Cup team competition pitting Team Pittsburgh against teams from New York, Canada, Cleveland, Arizona, California, and more. The WPH Pittsburgh Ladder Holiday featured three times the available Ladder ranking points than weekly Ladder play, meaning Pittsburgh’s Ladder elite would need to bring their best or tumble down the rankings. Andrew “JCC” Joseph entered his match with Mathieu “Trash Talkin’” Pelletier as the slight underdog, seeded 5th and ranked 6th on the Ladder after a disastrous fall campaign that saw him injured and incur a catastrophic losing streak upon his return. “I visualized beating TTP in the opening round 25-6, but I outperformed by expectations,” snickered JCC. The 25-4, 15-minute beat-down continued a streak of four consecutive main draw matches in which TTP has failed to score more than five points. Third-seeded Kirk “Big Game” Rys was overheard telling fans to not bother showing up to his early match against sixth-seeded Rodney Fink, because “it was only RFC.” BGR backed up his statementin the all-attorney first round, nearly serving RFC a bagel just days before the start of Hanukah. Second-seeded Smokin’ Joe Delsardo arrived at Amerifit’s House of Pain not knowing who he would be facing, while his mystery wildcard, motorcycle riding, power-serving, C-town southpaw Carlos Vasquez had been breaking down film of the former Pitt starting receiver all week. “That really didn’t seem fair,” lamented SJ. “I was seeded second and had to play a first-round war.” SJ advanced in a nearly 45-minute battle. JCC appeared to have a legitimate shot at the finals, as he faced an apathetic and unprepared NE Mike. NE Mike did not have his legs, conditioning, or shots, but still managed to overcome the fist-shot master in a battle of attrition. “NE Mike really had nothing but he gutted it out,” stated RFC. 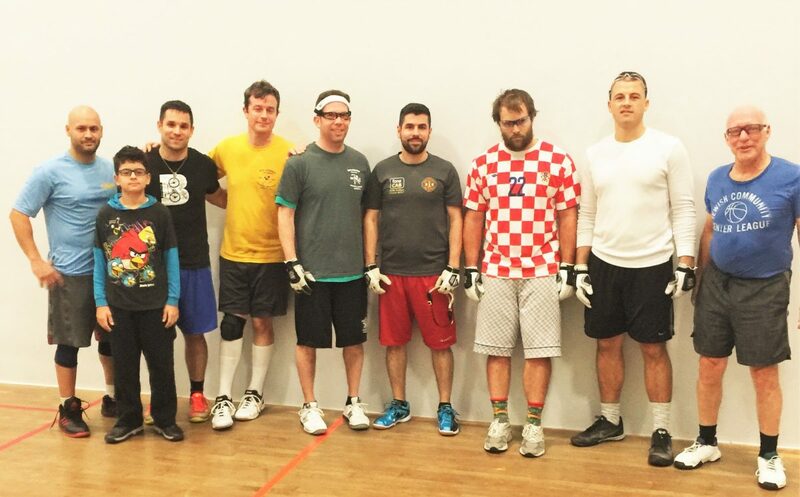 The final was played in primetime, as top-seeded New England Mike and second-seeded Smokin Joe met after a five-day break for the Pittsburgh Ladder Holiday Cup title. New England Mike dominated games two and three, outscoring SJ 30-6 to take a two games to one lead. “It just didn’t really seem like Joe wanted to be in the court in the second and third games,” stated NE Mike. Big Game Rys hooked up with longtime rival JCC in the 3rd place final. More than 1,000 matches between Big Game and JCC made this rivalry a hard-hitting, intense affair, complete with arguments, hundreds of visits from the vulgar police, and hundreds of title changes between the two. BGR took a 24-16 lead in the one game to 25 3rd place final and seemed to be on the verge of a routine victory. “It looked like I was rolling and on my way to a relatively easy win,” stated Big Game. JCC roared back to cut the deficit to 22-24. “JCC just caught fire.” BGR finally closed out the match to finish the Pittsburgh Ladder Holiday Cup third and finish the 2017 Ladder season ranked #4. Fueled by his embarrassing 25-4 main draw defeat, Trash Talkin’ Pelletier took his frustrations out on Super Bowl Silva in the 5th place playoffs, crushing his archrival in a one-sided thrashing. C-Town’s Vasquez ousted RFC in the other 5th place semifinal. Thank you to Mike Semplice for hosting the Pittsburgh Ladder Holiday Cup and thank you to all of the Pittsburgh Ladder stars for a great 2017.